Famous for its midnight showings of The Rocky Horror Picture Show every Friday and Saturday, the 8th Street Playhouse featured a great roster of revivals, cult classics, and foreign films. This ad is from the March 1982 issue of the now-defunct East Village Eye. They had some great double bills too: in the early ’90s I saw Duck Soup and Animal Crackers, as well as A Streetcar Named Desire followed by Who’s Afraid of Virginia Woolf? I believe they closed their doors in 1992. The video store that then occupied the circa-1929 theater went bust several years ago. I think a “Store For Rent” sign is up where the marquee used to be. This entry was posted on February 24, 2010 at 5:47 am and is filed under Music, art, theater, West Village. You can follow any responses to this entry through the RSS 2.0 feed. You can leave a response, or trackback from your own site. Wow, thanks for this blast from the past! The Eighth Street Playhouse was a theater I spent too much time in during my teen years–they had some great eclectic series there, like the extensive and exhaustive Films of the 1970s retrospective–in 1981, I believe. The last film I saw there was Full Metal Jacket in 1987. I remember seeing “Union City” with Debbie Harry at this theater around 1981 — and countless midnight showings of “The Rocky Horror Picture Show.” No one did (or does) Rocky Horror like the crew from the Eighth Street Playhouse! In fact, I lost my RHPS virginity there! Best double feature ever – The Kids Are Alright and Rock and Roll High School. ….When REAL NYC theaters played REAL films for REAL people, not the bland crap that passes for entertainment today, at $12.50 a head…. By the way, Jimi Hendrix’s Electric Lady Studios is still located underneath the former 8th Street Playhouse. I saw so many great midnight shows there; RHPS several times, A Clockwork Orange, Eraserhead, Mondo Cane, Martin just to name a few. What memories and fun! Thanks. The 8th Street Playhouse had two notable film festivals. The first was circa 1976 and inspired by the book, “Silent Clowns”. They played Raymond Rohauer silent comedy prints with live organ including “Sherlock Jr.” and “Why Worry”. The other festival was circa 1980 and featured 3-D dual projection prints including the restored version of “Dial M for Murder” and a Technicolor print of “Kiss Me Kate”. Regarding the above post, it was the Art theater that played an original print of “The Producers”. What was unique abou that copy was that it contained the scene with William Hickey sitting on the dynamite lever which is what blows up the theater. Either Brooks or Embassy later cut that scene although they included it as an extra on the DVD. The Art theater played “The Producers” in 1:33 which was a mistake since it was intended for 1:85 aspect ratio. As a result I saw mike booms on the top of the frame in the office scenes. The Art theater also had a Sam Goldwyn festival in the seventies. I went to the revival theaters in NYC two or three times a week while I was at NYU from 1975-1979. After I became an indie filmmaker, I ended up booking some of my movies in a couple. My movie “Space Avenger ” played Bleecker Street Cinema and “Head Games” played the Waverly. New Wave Film Distribution, Inc. 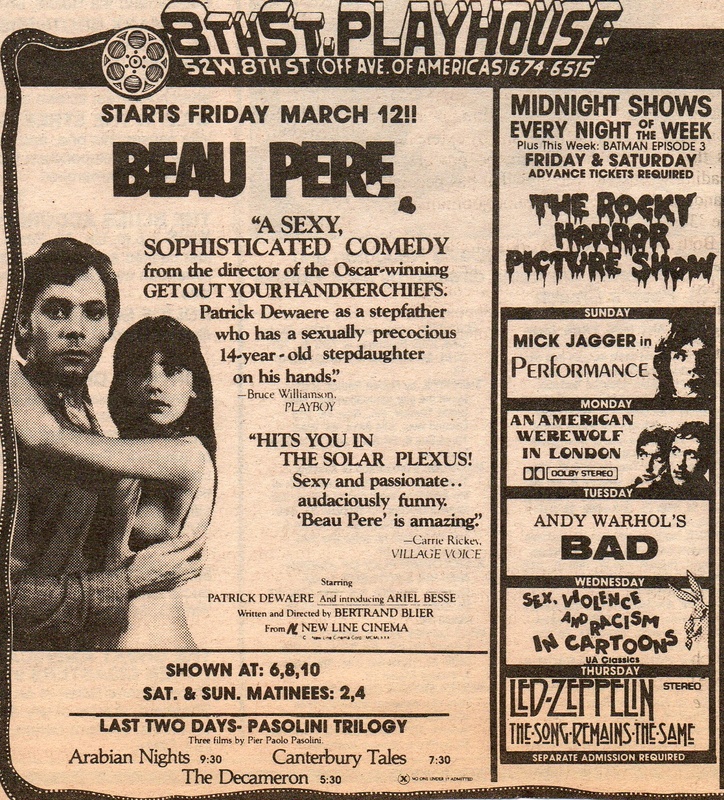 I forgot to mention the strangest double bill I saw at the 8th Street Playhouse in the seventies. “Lawrence of Arabia” with “Dr. Strangelove”. I didn’t get the connection and it was one long show at 5 1/2 hours. The “Lawrence” print was pretty worn at that screening. The Elgin showed a near mint print of “Lawrence” several times and it had more saturated color than the 70mm restoration. It was the best print I ever saw of that movie although it was the 1971 re-edited re-issue. In the 8th Street Playhouse 3-D festival they played a rare print of “Sea Dreams” which was a Florida theme park short. They also showed “Andy Warhol’s Frankenstein” in 3-D which is nearly impossible to see now in it’s original form. The DVD is flat, not 3-D. I will NEVER forget seeing “Andy Warhol’s Frankenstein” in 3D at 8th St. That gratuitous piece of liver on the end of a pointed stick seemingly dangling and then dropping over the audience. Priceless!